Sedimentary and biogenic features of siliciclastic rocks and detrital deposits, with emphasis on factors controlling fluid flow. Solution-generated collapse structures, associated with bedded evaporites. 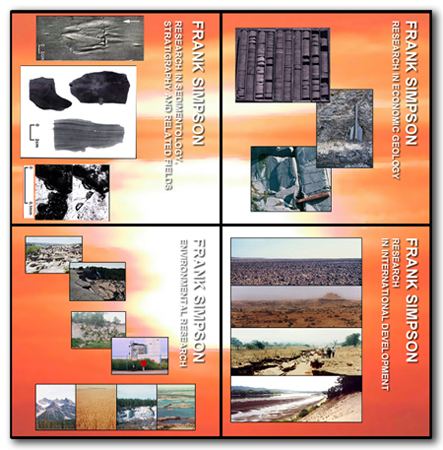 Subsurface-geology information systems. Integration of water-resource management, soil conservation and revegetation of degraded lands. Projects include: consultation for protection and management of water source for South-to-North Water Diversion Project, Henan Province, China; river bank stabilization, Ukraine; gully erosion, Nigeria; conjunctive use of water resources in Deccan Trap, India; hydrocarbon potential of Kenya; reservoir geology of shallow, low-pressure, low-permeability gas reservoirs in Western Interior, North America; and deep-well disposal of fluid, industrial wastes. E-mail: franksimpson@onebox.com or franks@uwindsor.ca or contact Frank Simpson by using the form below.